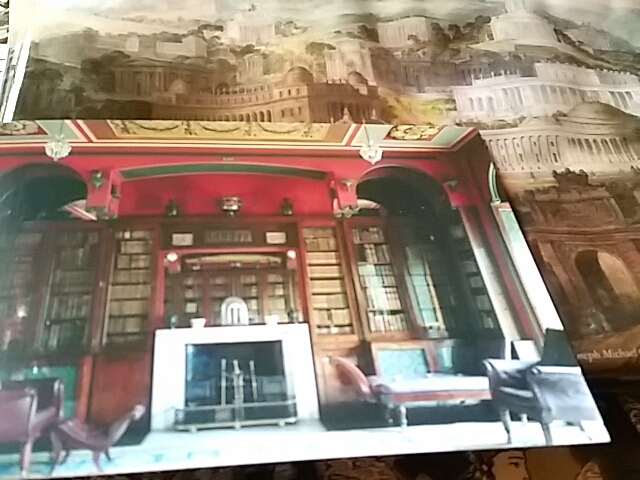 I wrapped up my trip to London with a visit to the Soane Museum. Back in my days at architecture school, this was the gold standard, a pilgrimage destination. You did modern buildings for money and then, if you were really lucky, you went home to something like this. Oh yeah. They don’t let you take photos, which is why I’m sharing this postcard, with a reproduction of a Joseph Gandy painting behind. Look at that room! All the primary colors! No surface left undecorated! Not nearly enough light! It has it all, in a way that only Soane could carry off. I actually lived in a tiny house that was filled with bits and pieces of artifacts from our travels: miniature buildings, tons of books, cool old stuff everywhere you looked. It even had a little room in the back with dark walls — in my case, forest green. In the divorce I got the house — hey, it was mine to begin with — and he got most of the contents. You know what? I never missed a bit of it. Valuable lesson. Now here I am with my own big house. True, it lacks the squirrelly floor plan. I probably won’t ask Stuart to add any column – free arches. But still, big, and more or less contemporaneous with Soane’s house. Now that I can have them, do I want red, blue and yellow, filling up my very own living room? No way. It was a funny feeling, standing in the shop of a house I once wanted to move into, flipping through a book by an old friend and a video where they interviewed people I used to take classes from and work with. There was a time when this was all really important to me. And today? I just wanted to get away from all but the friend. Interesting stuff, but not for my house. Another valuable lesson. Or are we raging against the dying of the light by making our spaces as light as possible to enjoy in our decrepitude? I used to love all those rich, dark colours, can’t live with them now at all. Oh yeah, I’m old. No way would I choose Lady Gaga as my karaoke choice. Acrually it would take a gun to my head to get me to do karaoke at all but that may be more of a personality thing. I’m telling myself that I like simplicity. It will be interesting to see how simple this 3-story house for one really turns out to be. It wasn’ t actually karaoke! I’d rather walk over broken glass than do that. I was just dancing to Lady Gaga covers by the band and singing under my breath. In front of our artisans extended familes and was only 59 year old on dance floor. Those pale pastels were nice, weren’t they, and just right for that soft shade of blue in the sky in the Vendee. They completely changed my thinking about color. I have finally pinned our palette down and will be pale neutrals and pale pastels everywhere. This is big relief as I have changed my mind so many times re colour scheme for house . Strangely, seaside apartment colour scheme came to me instantly, but it is a totally different place. That should be nice. I once saw a house that was a dozen different shades of white, sometimes three or four in the same room, depending on the character of the light that would fall on each wall. The concept was a little precious, to be sure, but the effect was quite pleasant.